Dan Harmon's Starburns Industries is following up the acclaimed Anomalisa with another stop-motion animated feature named Bubbles- a bizarre sounding fictional biography of Michael Jackson's pet chimp. We first reported on the project- based on a Black List nominated screenplay- nearly a year ago. Now, it seems the project is moving forward as a director has signed on. As with Anomalisa, the new feature will be bringing on a director from outside the animation world. 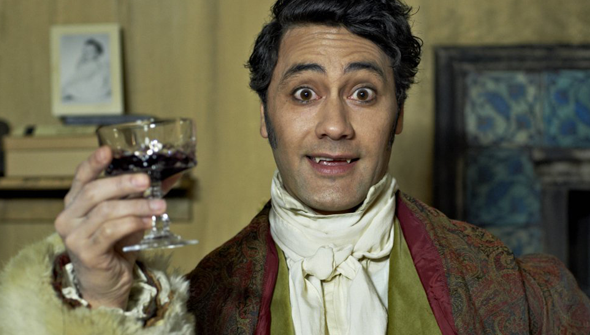 Live-action director Taika Waititi is a New-Zealand based director responsible for the excellent films What We Do In The Shadows and Hunt For The Wilderpeople. He is currently working on the upcoming Marvel movie Thor: Ragnorok. Fans of his films know that he has a unique comedic sensibility that should translate well to animation. Wilderpeople proved that beyond his impressive comic chops, he also has the ability to bring real heart to his films too. It's not quite his first brush with animation- he also received a credit on Moana- but it will be his first time directing an entirely animated film. Just as Anomalisa paired animation newbie Charlie Kaufman with animation veteran Duke Johnson, Waititi will share director's credit with Mark Gustafon (previously director of animation on Fantastic Mister Fox). Waititi said of the project "This film is not about Michael Jackson because that’s not a story for me to tell – or a story I’d be comfortable telling – it’s about a chimpanzee’s fascinating journey through the complex jungle of human life." "I think animation is the only way to approach a story like this. I really loved Anomalisa because it was beautiful and authentic in its meditation on loneliness. I’m really excited to be working with Dan Harmon and Starburns as we share similar sensibilities and want to tell human stories in unique and artistic ways." This project already sounded intriguing- but add in one of the most exciting directors working today and this could be something really special.